It’s times like this when sharpening your brainpower sounds pretty good! Not only does our memory enable us to recount names, dates or past events in our lives, it is also often associated with intelligence and increased effectiveness. While many people believe that gradual memory loss is simply a part of growing older, in reality it may be an indication of a more serious condition. Multiple studies have demonstrated that cognitive decline is NOT a normal part of aging and that there are a variety of risk factors associated with cognitive decline. Transfer Factor ReCall is formulated to give your brain the boost it needs. It includes patented Targeted Transfer Factor for superior immune system support—targeted specifically to the brain—as well as other ingredients known to affect the pathways associated with mental acuity and promote overall brain health. 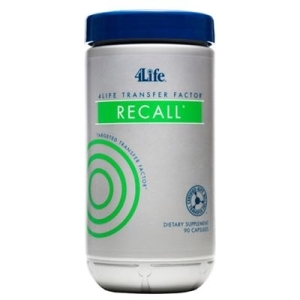 4Life Transfer Factor ReCall targets the superior immune-enhancing benefits of transfer factors to directly support the brain and central nervous system. Targeted Transfer Factor lends important support to keep inflammation at normal and healthy levels within the brain and central nervous system. Transfer factors are tiny messenger molecules that transmit immunity information from one entity to another, such as between a mother and her breastfeeding infant. These “smart molecules” support healthy immune responses, including the body’s ability to remember past health threats. 4Life Transfer Factor ReCall is backed by an exclusive patent (US Patent 6,468,534) for obtaining specialized transfer factors from egg yolks. Among many other significant health features, the biological actions of vinpocetine show that it promotes circulation and oxygen utilization in the brain and healthy blood flow. Glycerophosphocholine and Huperzia serrata (Huperzine A) have been shown to enhance alertness, mental agility, and recall. Huperzine A works by inhibiting the enzyme that breaks down acetylcholine, an important brain chemical for learning and memory. "My wife had been dealing with some dizziness and stability problems for about two years. She had been taken Transfer Factor Plus and was reading about 4Life Transfer Factor Recall and decided to try it. We have definitely noticed a positive difference in her life. She is a Realtor by trade and tell everyone about these products. Thanks 4Life! Our experience with 4Life products has greatly improved our quality of life." "My nine-year old son has had trouble concentrating. He has been taking 4Life Transfer Factor ReCall for some time now. Everybody who knows him is surprised because he is calm, quiet and has much better behavior." "I have a great testimony on Transfer Factor ReCall and my seven year-old son. I've been getting positive feedback from his teacher in regards to his concentration level. His grades went from the 50s to the 80s and 90s. I really believe this additional support to his immune system contributed to the increase in his ability to focus, retain and concentrate."